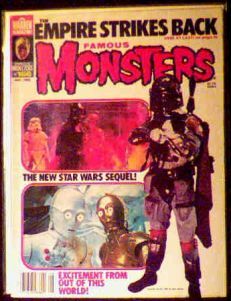 August 1980 issue of FM with more on the Empire Strikes Back. Also includes article about Veronica Cartwright of Alien and The Birds, plus photos and story from Black Sunday. Near-mint condition. I didn't see Black Sunday until it showed up on AMC around Halloween last year. It was a very nicely done film, despite the dubbing into English. The voices reminded me of an old Hercules movie (where all the men sound like Alexander Scourby), but the photography was great. Website design and hosting by Sohodojo Business Services. Item 142 of 466 items displayed in viewer. 0 items in cart.